In this article, we'll learn how to get started with Azure SignalR service to scale out the service in the cloud without any limitation and infrastructure problems. To scale up SingalR, we have a couple of options, like Radis and Azure Service. At the time of writing this article, Azure Service is in Preview. Soon, it will be released as version 1.0. It is a fully managed service to add real-time functionality to your application. This article is part of the series of posts on SignalR using ASPNET Core. Overview of New Stack SIgnalR on ASPNET Core here. Getting started with SignalR using ASP.NET Core and Angular 5 here. Working with dynamic hubs here. This article demonstrates the following. Creating Azure SignalR Service instance. Accessing Azure Service keys and Connection string. Creating Project Template using .NET CLI. Consuming the Azure Service by Angular Client. Before reading this article, I would highly recommend you to go through the other articles of the series which are mentioned above. Now, we are going to create an Azure SignalR service instance. Go to the Azure portal by accessing http://portal.azure.com. If you don't have an Azure subscription, then get started with a free Azure account (https://azure.microsoft.com/en-us/free/) and try out. To create an instance of service, click on "Create a resource" (top-left,) then search for SignalR service and click to that service. It will open a window detailing about the service and you will find the "Create" button at the bottom side. Now, you have to fill the required details like Resource Name, Subscription, Resource Group, Location, Pricing tier. 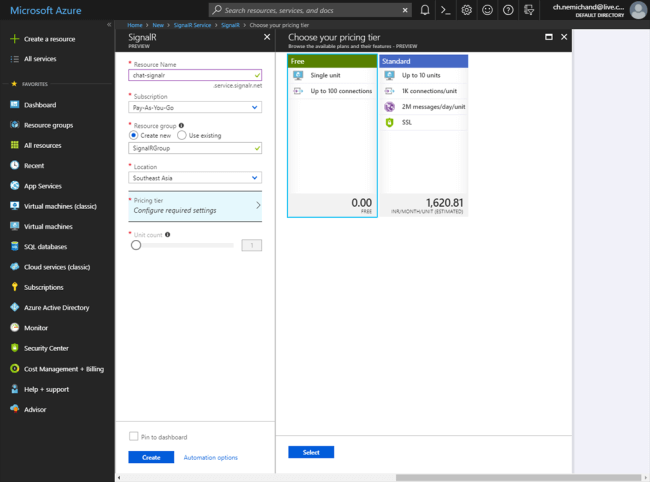 Azure pricing tier offers you free instance for a tryout. After creating Azure SignalR service instance, now we need a service key and a connection string to use that service. The key info is available "Keys" link under Settings option. We are done with the Azure SignalR service. Now, we have to consume that service in the client. Now, we are going to create a project template to use Azure SignalR Service. This time, we'll use .NET command line interface to create the project template. It uses "DOTNET" keyword to start any command on CLI. Command - to create a new project. dotnet - prefix keyword to use any command in .NET CLI. new - create/initialize .net projects. Angular - ASPNET Core with the Angular template. Name - Name of the project to be created. If you not mention the name of the project template than project created by the folder name. The project has been created successfully using dotnet cli command. See the image below for reference. We have created an Angular template project. Now, we need to initialize the npm and install npm package for SignalR. So, I'd highly recommend you to go through Angular versions here. We are going to use Azure SignalR client in order to use Azure Service. We need to install Azure SignalR client SDK "Microsoft.Azure.SignalR". Azure SignalR SDK allows the ease of use API just to change a couple of APIs and ready to use Azure SignalR service. 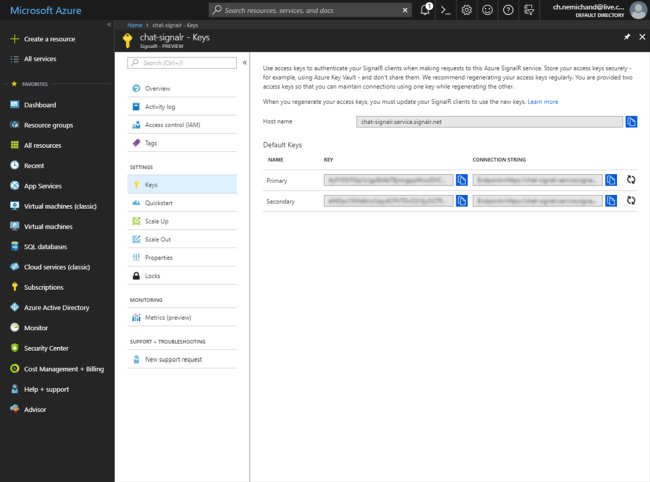 In order to use this service, we have to AddAzureSignalR in configure service method and pass the Azure connection string which is copied from the Azure portal. I'm passing the same using configuration file (appsettings.json). After adding Azure SignalR service, we need to use the Azure SignalR route pipeline to map the hub which is done in the configure method. Map the hub with URL to work correctly. We have done with Azure SignalR SDK. In this article, we have seen scaling out SignalR on Azure using ASPNET Core and Angular 5. We have learned the following. 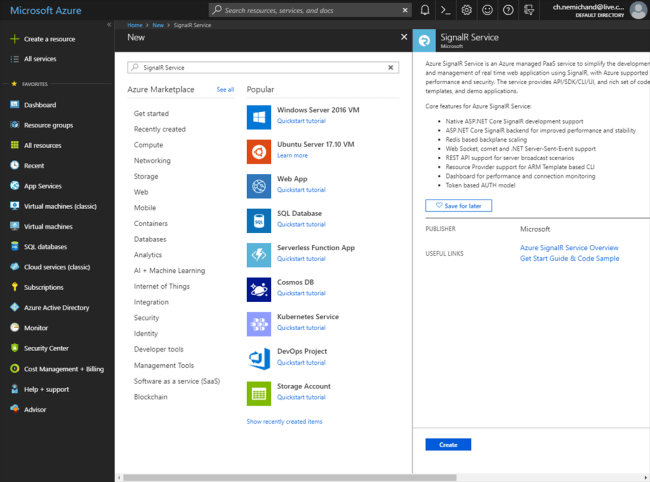 Creating Azure SignalR service instance and accessing keys. Project template creation using dotnet cli. Consuming azure signalr service by Angular client.